Vaarso Battlespeak Notation: After the application of the New Model Army reforms, essential to fighting the Wars against the Fenrig Imperative, few units survived the conversion from the obsolete Colonial Force to the modern and effective Tohaa Trident. Those which, because of their special characteristics, could weather the conversion to new tactics and structures were allowed to keep the special nomenclature for attack units of the old Tohaa Colonial Force. That nomenclature, usually encompassing tens of thousands, consists of more baroque and archaic code-names than those used by the majority of current Trident units. In the old and adventurous days of Tohaa colonization, Makaul Troops were also known as Light Assault Units. However, the name that stuck with them is their old numeric code-designator: Makaul, the 10100. 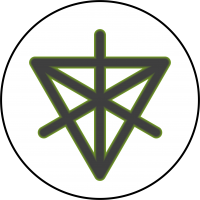 A special number whose symbolism refers to titanic strength and courage as well as the concept of salvation from a physical danger. 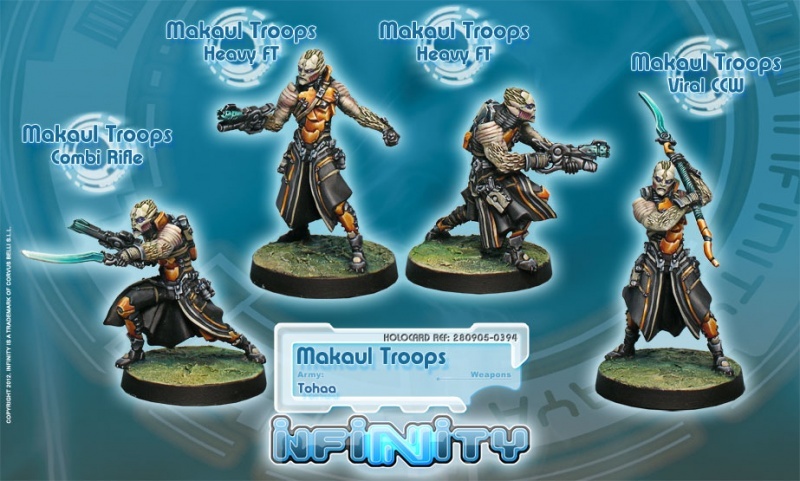 Profile: Makaul Troops are both the most decorated and also the most troublesome unit in the Tohaa Trident. Heir to a glorious past, they characterized the age of Tohaa colonization and exploration. Specialists in light assault and close combat techniques, their mission was to be deployed in far-flung positions with minimal equipment, to face an overwhelmingly superior enemy and win without expecting any support. How many times was a Tohaa outpost saved in extremis of an attack by wild beasts, savage tribes or insurrectionist rebels by a small group of these daredevil warriors? They soon became part of Tohaa popular culture and the main characters of the greatest deeds and adventures, both real and fictitious. However, these bold and boastful warriors, forged in the fires of warfare, true combat dynamos, don't deal well with peaceful times. Makaul Troops constantly need the energy of action. The nightmare and torment of local authorities and Tohaa military police, they are as troublesome in peace as they are good in battle. When not in combat the Makaul are well-known for their dependence on Socar, drinking, playing and fighting constantly, both between each other and against anyone crazy enough to cross their path. There is no chance for rest, as these mad soldiers are addicted to strong emotions. To them there is always an objective to take, an enemy to annihilate and a victory to celebrate. Because that is the unit's spirit and if you don't like it, any of them will be more than willing to discuss the matter with you. And you can be sure there will be more than words involved in the process! This page was last modified on 7 April 2018, at 15:46.